As a small company, we rely on maintaining a team of flexible and diverse staff who complement each others' skills and experience in a shared living and working environment. 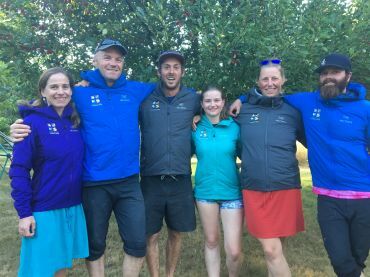 As a team, we run a world-class wilderness retreat that delivers inspiring sea kayaking experiences in sync with the local area and community. To inspire people with the wonder and joy of getting to know BC's rugged and remote west coast through sea kayaking and marine/cultural ecology experiences that contribute in positive ways to the health and well-being of our guests, staff, community, and the Kyuquot area. In January 2016 we had the honour of receiving the "Employee's Choice Award" in the 2015 Comox Valley Chamber of Commerce Community Awards. We have since established and sponsored the "Sustainability Award" for local businesses and organizations, encouraging awareness and improvements in our community. Otherwise, feel free to contact us if you think you'd be a great fit with West Coast Expeditions, either guiding (SKGABC certified), caring for camp systems and guests, or whatever other magic you offer. Foremost, we look for people with a demonstrated passion for the west coast, an interest in life-long learning, proven emotional intelligence, and a sense of gratitude and reverence for where and how we operate. know that they're an essential part of delivering exceptional experiences that meet high standards for responsible and sustainable travel, and make a difference in peoples' lives. 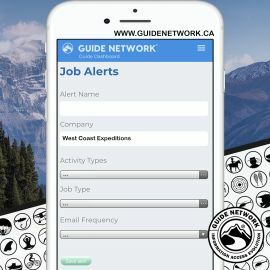 You can otherwise track updates to job opportunities/alerts with West Coast Expeditions through Guide Network!